In our current technological age, it’s important for manufacturers to embrace digital transformation or risk getting left behind by the competition. 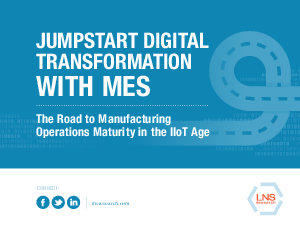 LNS Research has been studying the industrial software market for years, and in talking with hundreds of successful manufacturers, they found one common theme—the importance of finding a starting point for digital transformation. Leveraging MES software can be a low risk, high-value entry point for manufacturers as they journey toward digital excellence. Read the LNS Research study to learn why an MES solution from Epicor is an important component in reaching operational maturity and digital transformation.